Having found a little hideaway in a lovely cottage in Nightingale Square Kate thinks she may be able to escape not just her family who live in Wynbridge (featured in Heidi Swain’s other books) but also her soon to be ex-husband David. His indiscretions can no longer be ignored. However hiding away is not what the locals have in mind for Kate. When the whirlwind that is Lisa arrives, with her children in tow as well as Heather and her new perfect baby, Kate is thrust into community life and has to face perhaps some of the baggage she has been holding onto. But it is not just the cottage that interests Kate but also the big house that dominates the square – Prosperous Place. When Prosperous Place is sold, the community fears that it may be developed and the feel of the square will change. But the new owner, Luke has some link to the house and wants to bring it back to what it was and when he lets the community use the gardens for a community allotment he gets a lot more than extra vegetables. He starts to make friends………. Kate’s background in history and antiques means that she is in an ideal position to help Luke but when the past no longer remains history and comes screaming back into the present it looks like Nightingale Square could well change forever. I thought I was going to get another story from Wynbridge, as I have grown to love that place and all its characters. Whilst this book is connected (Kate is Jemma’s (Cherry Tree Cafe) sister-in-law) it firmly takes place in the square. It has a mystery from the past, a sense of community, great characters and some well written annoying ones who could get under your skin within a couple of sentences. All signs of a great read and one you will not want to put down, in fact I would have happily packed my bags and gone and lived there. There is a skill to writing books which drag you not just into the story but also to care about all the characters, no matter how much of a role they play. This and any of Heidi Swain’s novels meet that requirement. Thank you to the publisher and netgalley for the opportunity to read this book. 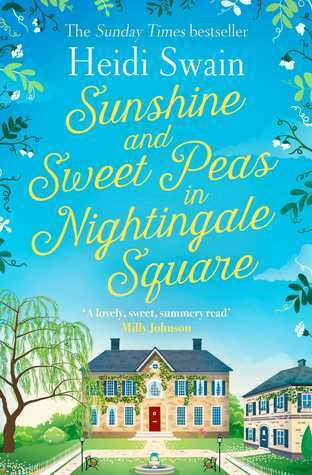 Sunshine and Sweet Peas in Nightingale Square is out now. I still have this on my tbr. Really must try to get to it before summer finally vanishes! It is a great read at any time of the year!